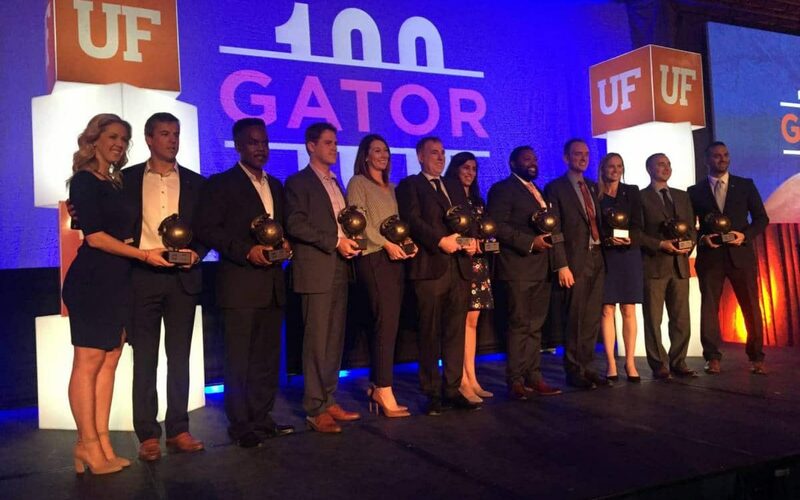 GAINESVILLE, Fla. – The University of Florida recognized the 2018 Gator100 honorees on Friday at the Reitz Union Grand Ballroom. Presented by the UF Alumni Association and the Entrepreneurship & Innovation Center at the Warrington College of Business, the Gator100 honors the 100 fastest-growing Gator-owned or Gator-led businesses in the world. The event serves not only as a setting where UF’s elite entrepreneurs can gather and share their talents and wisdom, but as an inspiration to fellow Gators to be a part of this exclusive group. The Gator100 honorees total $6.2 billion in 2016 earned revenues, employ 43,679 people at their companies, represent 17 states across the U.S. and include two internationally-based companies. Companies are ranked by compound annual growth rate over the past three years, determined by the global accounting firm Ernst & Young. View the complete list of Gator100 honorees here. ACY Contractors was the top-ranked company with a compound annual growth rate of 159.51 percent. The Orlando-based company provides construction management, general and trade construction services for K-12, higher education, healthcare, federal and other niche markets. ACY is led by Michael Young, a graduate of the College of Design, Construction & Planning. NuJak Companies, led by the College of Design, Construction & Planning’s Frank Kendrick, came in second with 147.44 percent compound annual growth. Salon’s Choice came in third with 144.04 percent compound annual growth. Salon’s Choice is led by Warrington alumnus Oren Kantor. Power Production Management, led by Herbert Wertheim College of Engineering alumnus Jason Gonos, came in fourth place with 108.71 percent compound annual growth. Veteran Energy, led by College of Liberal Arts & Sciences alumnus Darin Cook, rounded out the top 5 with 104.01 percent compound annual growth. Alex Moreno of Nightingale Nurses won the S. Clark Butler Pinnacle Award, which recognizes an established business leader who has demonstrated success in their industry. The recipient is an entrepreneur who has shown sustained excellence and leadership. Moreno is the CEO and co-founder of the healthcare staffing company and is an alumnus of the Herbert Wertheim College of Engineering’s Chemical Engineering department. Thirty-four of the 100 companies honored on the list are led or owned by Warrington alumni. Since the Gator100 was founded in 2015, more than 150 companies led or owned by Warrington alumni have been included on the Gator100. Five of those companies have been on the list all 4 years including Cabinets.com, Study Edge, Victory Tailgate, SSP Innovations and The Bowman Law Firm. Three of the companies in the top 10 are led by Warrington alumni. Salon’s Choice (#3) is led by President and CEO Oren Kantor (BSBA ’10, MSE ’11), Todd Hoffman (BSBA ’02, MS ’03) is the CFO of Chloe’s Fruit (#7), and Orlando Legal is led by CEO/Managing Partner Jonathan Simon (BSBA ’04, MA ’05, JD ’07) and Attorney/Co-Owner Jill Simon (BSBA ’04, JD ’07). In addition, 10 of the top 20 are led or owned by Warrington alumni including RedTeam Software (#12), Cabinets.com (#13), RVG & Company (#14), AspirEDU (#15), Abode Luxury Rentals (#17), JWB Real Estate Companies (#18) and The Free Ride (#20). To be considered for the Gator100, companies must have been in business for five years or more as of Oct. 1, 2017 and have had verifiable annual revenues of $250,000 or more in 2014, or for the past three full fiscal years. A University of Florida alumnus or group of alumni must have owned 50% or more of the company from Jan. 1, 2014 through Oct. 1, 2017. A University of Florida alumnus must have served as the company’s chief executive (for example: chairman, CEO, president or managing partner) from Jan. 1, 2014 through Oct. 1, 2017. A University of Florida alumnus must have founded the company and been active as a member of the most senior management team from Jan. 1, 2014 through Oct. 1, 2017.